We spent an extended weekend in the Eastern Sierra mountains to see the fall colors. On the first day we went to see the tufa at Mono Lake - no fall colors there, nevertheless an interesting spectacle of nature in the late afternoon and after sunset. 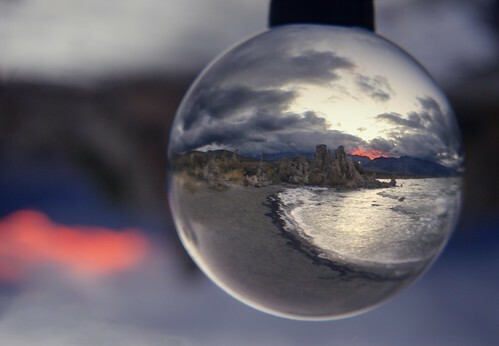 I took out my crystal ball and placed it on a tripod. Focusing on the scene in the crystal ball was a bit of a challenge. Tufa are limestone towers, formed when carbonate minerals precipitate out of underground spring water entering the very salty water of Mono Lake. The lake level dropped, therefore we can see now the tufa above the lake. I processed a balanced and a photographic HDR photo from two RAW exposures, merged them selectively, and carefully adjusted the color balance and curves. I welcome and appreciate constructive feedback.